Christmas is the time of giving and the Hamill beekeeping family will be doing just that! Each year they give up their Christmas Day to volunteer at various charity events around the capital. This year they will be doing volunteer work at the 2015 Rotary Club CHRISTMAS DAY LUNCH AND TEA PARTY FOR THE ELDERLY OF WANDSWORTH. Around 400 people attend the lunch each year and it is all completely free – guests do not pay a penny. The Rotary Club who organise the event rely entirely on the commitment of volunteers. In fact without volunteers being there to help on Christmas Day the Party could not go ahead. Us joining in is our way of saying Happy Christmas to elderly people in Wandsworth. The duties involve being at the venue by 8.30am on Christmas Morning; going out on a bus with a professional driver and helping the guests from their homes onto the bus and safely back to the venue as well as the home run which will start at around 4.30pm. • Making fresh sandwiches as a take away supper for our guests. • Help is needed in the kitchen working with the chefs to prepare lunch. • Bring good cheer with a happy Christmassy welcome when the guests arrive. • Serve tea and coffee and, later on, sherry before lunch. same time hot and delicious. • Serve a glass or two of wine with lunch. 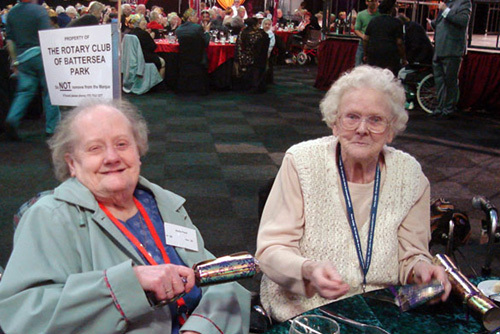 • Help the elderly guests enjoy the afternoon’s entertainment – dancing, sing-alongs and bingo. Chat with a friendly person, be there for them. • Clear tables at the end of the day and ensure the marquee and kitchens are left spotless. Often elderly people are neglected at Christmas time. So whatever support and help you can offer over this holiday period will make a big difference to someone alone. We hope that you will join us to put this right. Merry Christmas from all of us at The Hive Honey Shop!